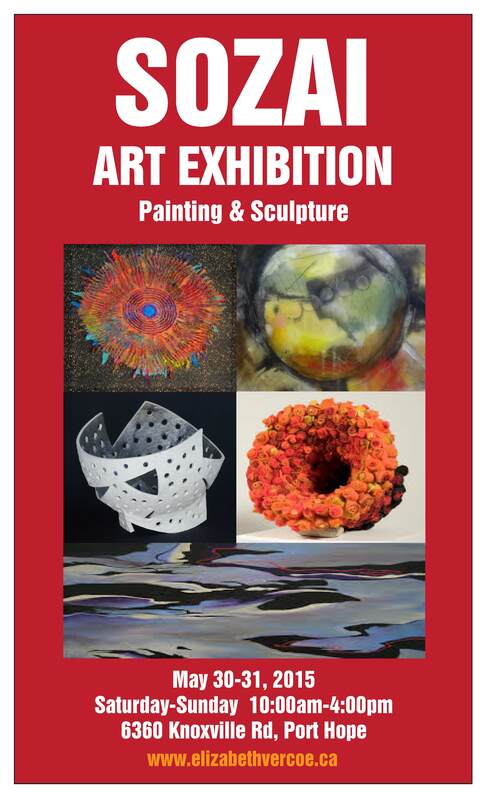 Featuring the work of Michiko Nakamura (sculptor), Gundi Viviani-Finch (glass and fibre artist), Peggy Mersereau (fibre sculptor), Pamela Tate (fine art painter), and Elizabeth Vercoe (mix media fine artist). The name Sozai is loosely translated from Japanese to mean the “elemental ingredient or component”. All 5 artists have embraced this idea for the exhibit and hope to intrigue the public with their interpretations on the theme. THE LOCATION You will find this very special exhibition nestled in the beautiful and peaceful setting amidst the rolling hills of Northumberland County. Minutes from Port Hope, easy to find; follow the red signs and banners. THE ARTISTS MICHIKO NAKAMURA’s amazing sculptures have long been a must see on the local art circuit. They are the result of the collaboration between herself, porcelain clay and the fire. The flow of energy between herself and these elements is evident in her unique magnificent organic abstract form of art. Her organic sculptures and vessels each tell a story of her communication between herself and the clay that is visibly tangible. Over 100 unique sculptures are displayed.